The back with the skirts down, no hem yet. So I've been procrastinating on The Revolution Dress because I got kindof stuck with those front rumples, but thanks to all your encouraging comments, I've gotten past that block. It was also due to the fact that I'm supposed to wear this monstrosity in two weeks and, well, it's got quite a ways to go. I've got the skirts in order. This involved pleating up the back portion that was in one with the back of the bodice (the "en fourreau" part), which probably would have been easier if I'd done the back pleating on the bodice correctly. 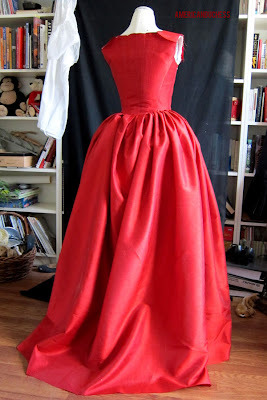 Instead, the skirts are sortof smooshed up under the pleats in back, then fan out from there. The fronts panels were easier to attach, and you'll be so proud of me, I actually did it all by hand, woo! Test-polonaising. This is just done with two pins to see how it'll look, and I quite like it! I've removed the buttons from the front, as a number of you pointed to those as causing some of the ripples in the bodice. I'll re-apply them when I do a final fitting over all underpinnings, and can place them perfectly for the fit. I've also go the straps half-sewn on - that is, the lining pieces are sewn down, but the red fabric has been left loose, so I can do a proper period sleeve fitting. I've not done this gown 100% period correct in method, but it's the closest I've come yet, and I've been thinking about proper period construction all the way through this. I may never sew the long skirt seams by hand, but I see now that the bodice construction is just, well, more manageable when you do it by hand. And, well, those buttonholes...yeah, they were on the machine, tee hee! I've still got warping, on the mannequin at least. I hope to get rid of most of this on my own body. Deadline is looming: June 18th and 19th, eek! Kudos to you for the hand-sewing (there's only so much of that I can stomach). 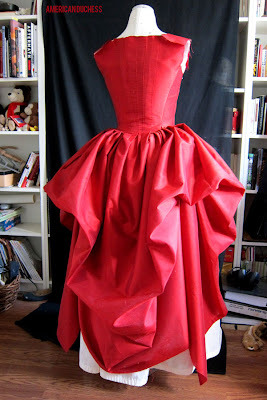 That fabric really is gorgeous, and the way you have it polonaising looks really beautiful. OMG the bustling/polonaising is SO BEAUTIFUL it makes me want to run to the store and buy yards of silk. I'm really happy with how the poofs in the skirt are working, and I think it has everything to do with the hand of the fabric. It's very stiff and crispy and light. I think doing a polonaise in muslin I'd line it with something like organza, or this same kind of lightweight silk, to make it puff this way. Thanks! 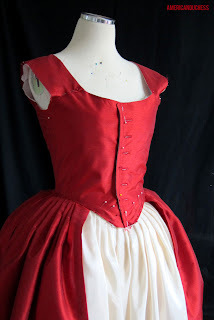 I'm thinking maybe if I just don't lace the stays on my own body so tight it'll help fill out the parts of the bodice that are rumpling on the dress form right now. Or I can readjust the side seams...argh, I've learned my lesson, though, next time cut it on the bias and don't interface it! DROOL!!!! It's so pretty! You are going to look awesome in it! I think it's simply stunning!